~Concurrently, nothing else is actually going on (but there is one chapter just two days before this we will see later from the 4th campaign) so Leon is picking up the story canonically. Chapter went great, very satisfied with this but for some reason I had a weird audio problem in the footage and I lost the last half of it, so I had to splice in solo footage. I think I'll leave you all to discover how the challenge went instead of just putting that here this time, just for the sake of surprise. Other than that, everyone can be seen within, so enjoy! Make sure to pay attention to the corners to find a few counters I've got running throughout this chapter. Here's a gif of Helena's head-melee too. The first file goes into detail about Leon, how now that he is 36-years old he's the top agent of the U.S. Government who reports directly to the president himself. 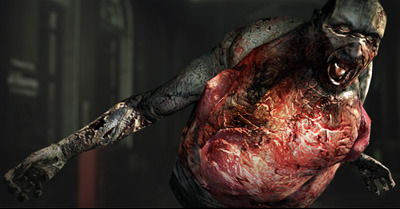 His past with Raccoon City has ingrained into him a deep-rooted hatred of bioterrorism and those who would use it. Although his rational demeanor suggest apathy, he is far from it, and is willing to take the initiative in any situation and do his best to save the innocent even if it puts himself in danger. As always, he still possesses his sardonic wit, and will often times let it surface to ease the tension in any moment, reminiscent of his time as a good-natured but rookie cop who was able to maintain a sense of duty and humor in the toughest of times. The second file goes into detail about Leon and his relationship with Adam Benford. During their time in the military, they were both champions of similar causes, a righteous desire to root out bioterrorism and end the threats of Umbrella's legacy. They grew close within their 10 years together only for their friendship to be abruptly ended after the incident at Tall Oaks. 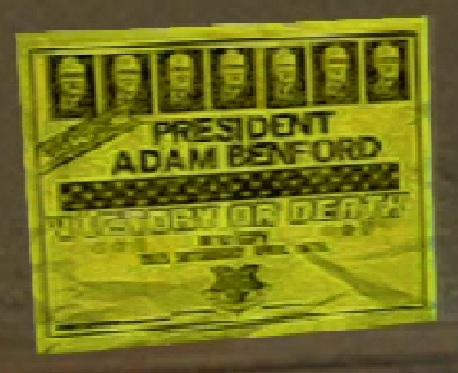 Adam was always known as a man of integrity, one of the few politicians who was deeply passionate about his goals, despite the criticisms of others to not reveal the truth of Raccoon City. The last two files talk about FOS, where Hunnigan works as Chief Advisor and Leon as Chief Agent, and the fourth file talks about the new zombies. Also, a good presidential slogan. Here are some quotes from posters I thought were insightful and help understand the story as we go on! Why, I do believe we have dead ringers for the design basis for Tall Oaks' subway; none other than New York City's own subway system. "You're a cop, you have firearms training, so aim for the head!" "Pick a target before shooting!" "Who made you the leader!?" I'm going to go back and look at that right now to see what else there is. Also the last two statements were probably already said in the video now that I think about it. Ok, there was a bit of fluff if you leave the zombies alone or don't kill them too quickly. Got to an interesting bit. Leon: "You're a cop right? You can handle a gun." Cop: "It's my first day, man! How can I aim in all this craziness?" It was heavily implied in RE3 that Umbrella's activities were at least tacitly endorsed by elements within the American government. As far back as the end of that game, when Jill finds a dead U.S. Special Forces team lying in the Dead Factory amongst a couple of dead Tyrants, we've known there was more going on there than we were made privy to; for one thing, there's a file near the end of the game that indicates the missile strike on Raccoon City was the government's idea and Umbrella was trying to stop it. It's one of the quieter plot threads in RE3, and was clearly meant as setup for a future game. If you're just some dude on the street in the RE universe, you're probably well aware that Umbrella created the T-Virus and that it got loose in Raccoon City, and you've got a pretty good chance of knowing what the T-Virus is. There have been multiple attacks within U.S. borders with the T-Virus or a derivative thereof by 2005 according to the first five minutes of RE: Degeneration, and it's probably only gotten worse in the intervening eight years. What you don't know is that the government had anything to do with Umbrella or the corporation's experiments; as far as you're concerned, Umbrella was a collection of secretive mad scientists who seriously fucked up. What Benford wants to do is come clean to the American people about the U.S. government's ties to Umbrella and its culpability in the creation of the T-Virus. He's not responsible for much of anything to do with it, and part of his background seems to be that he spent time as Leon's handler. Benford knows that it's going to create havoc and up-end the status quo, but he believes the only way forward is to end the cover-up. Basically, he's too decent a dude to live with the lie. That much isn't a spoiler, as it's said--albeit unclearly--in parts of the game that are already covered by the LP. Spoiler for the end of Leon and Jake's campaigns, sort of: One of the big villains of this game is the guy who pushed for the missile strike on Raccoon City. He didn't give the order, but he was an influential enough military officer at the time that he was able to influence the President into ordering the attack. Another point to be made: not only is there a dead U.S. Special Forces team, but they have a weapon specifically designed to fight bio-weaponry (the "Paracelsus's Sword" railgun, which also shows up in the Echo Six campaign of RE:ORC) and it is not a man-portable device. We thus know that the government had at least one squad in Raccoon City during the outbreak that knew enough about what it was dealing with to have had significant preparation time. The thing about the overarching plot in the RE franchise is that it makes sense, but it hides a lot of very necessary details off in the middle of some other unrelated game or tie-in and always has. There's a massive amount of the plot that draws on the Wesker's Report II dossier, which was released on Capcom's Japanese website back around the time the REmake came out on the GameCube, and which was never officially translated (IIRC). If you read that, it ties a lot of the pre-RE4 storyline together in a neat little bow, but I'd be shocked if even ten percent of the fans of the series know that it exists. RE6 is unwittingly a good comparative example; its plot makes a certain amount of sense once you have all the pieces, but much of it is hidden in the files, which in turn are hidden behind the Serpent Emblems. To really get what's going on, you need to dig through a bunch of unconnected nonsense scattered around disparate sources in places you wouldn't know to and shouldn't have to look. So it is with the series as a whole. An experienced government agent at the top of the food chain. He is a member of President Benford's personal group known as the DSO (Division of Security Operations), and he, like Chris, is a veteran and has seen much action since Raccoon City. Caught in the midst of another zombie nightmare, he is forced to shoot the president, his friend, to save his new partner Helena Harper, a young secret service agent and escape from the campus where the late president was to give his campaign speech, and reach the cathedral of Tall Oaks, the town hit by this latest catastrophe, in order to get to the bottom of their predicament. 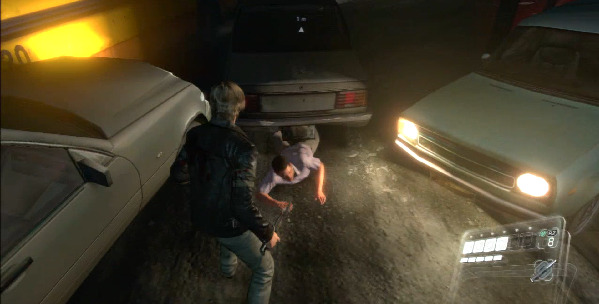 (Throw, Head-Front) Police Takedown - Leon takes an enemy down with the elegance all cops are known for. (Stealth Wrestling, Head-Back) Bulldog(?) - Leon charges up behind an enemy, grabs their head under his elbow and smashes their chin into the ground like a professional wrestler. (Basic, Varies) Reverse Roundhouse - Same as Sherry's roundhouse. Both Sherry and Leon also share the same counter-kick with one-handed weapons equipped. (Coup-de-grace) Judo Kick - Leon whirls around and delivers a sharp and powerful kick that pulps the head of anyone in its path. A Secret Service agent charged with protecting the president, she claims it was her fault that Tall Oaks, and the president, were killed. She volunteers to guide Leon to the Tall Oaks cathedral where she will apparently expose the mystery about the outbreak, and hopefully shed some light on the hidden truth. (Throw, Head-Front) Tilt-a-Whirl/DDT - Helena mounts an enemy and spins around their necks before driving them to the ground. (Stealth, Head-Back) Elbow Drop - Helena kicks the enemy's legs out and drops her elbow on their heads, crushing the brain-box. (Basic, Varies) Roundhouse Kick - Same as Piers' kick. (Coup-de-grace) Drop Kick - Helena delivers a powerful drop kick that totally smashes anyone in her way. Leons liaison within Field Operations Support(FOS). Having served alongside Leon for several years, she acts as a guiding hand and provides any kind of support necessary for him to make it through alive. 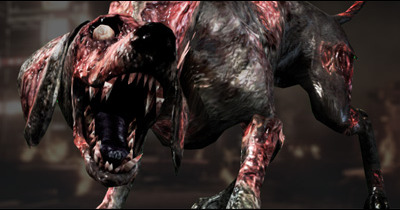 The new zombies are the same flesh-eating shamblers as ever, but with a bit of a twist. 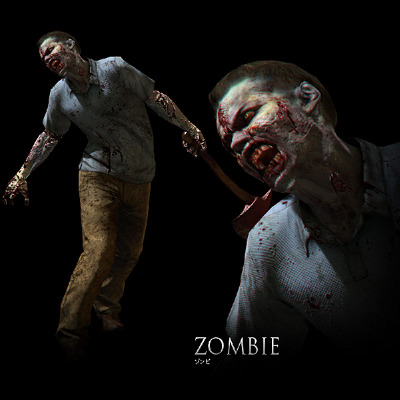 More a mixture of the T-Virus of years gone by and a rage virus, these zombies are capable of charging at you and are much more mobile than anything seen before. They can leap and crawl at imposing speeds and if they manage to grab a hold of you, will learn the folly of letting them get that close in the first place. They come with all sorts of weapons in hand or in torso, and there a variety of ways to take them out. Experiment but be cautious when dealing with a horde. To be swarmed leads to early death. A returning enemy from the days of Raccoon, they are no different and possess the same mobility and speed. Do not let them pounce on you. Keep a distance. Fragile and weak, easy to kill. A new type of enemy with only one method of attack: to scream at you then run away. 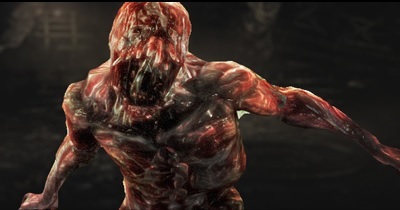 Although the scream only stuns and doles out little damage, it will incite all the nearby zombies to leap at you, and that would be a serious problem. Aim for the glowing sack that is their neck and fire away, or if you can, knock them over. Do not let them get away to regenerate their sonic attack. If you pop their neck, then the ensuing scream will explode the heads of all nearby zombies, so they work for you just as well as they work against you. The Bloodshot Crimson Head 2.0 is a monster that transforms from zombies. It is easy to identify which zombies will become this fearsome foe. Look for a zombie with a head that is crimson in color and/or glowing red eyes. To shoot them in the head or just damage them in general will force the transformation, however, some with these features may not transform. They are impossible to stun and only high powered weaponry will make them kneel. Master the art of counter-attacking if you want to fell them with ease, so you do not waste your ammo trying to bring these monsters down. Aim for the torso, as that is where their heart is located. 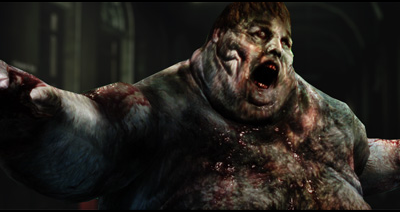 This fat zombie is a force to be reckoned with. It has a lot of health but it can be quickly toppled with well placed shots to its leg, and both players can team up for coup de grace attacks to bring it down quickly. It can charge, grapple with you, and knock you out, but its slowness is its greatest weakness. There is a larger and stronger version that can only charge at you called the Whopper Supreme, but it just has more health and is even easier to kill.